I alluded to this in an earlier post this week that Patrick got a new bedroom. Indeed! 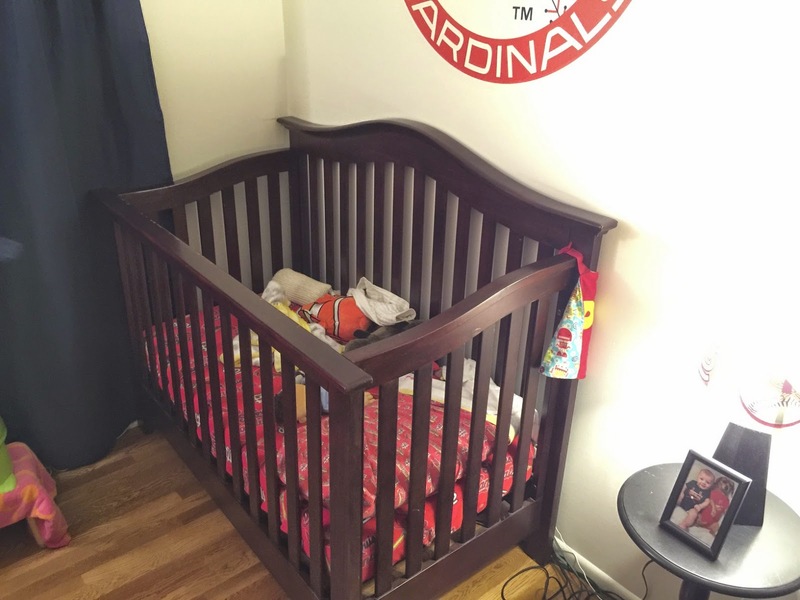 He moved to his new big boy Cardinals room last weekend and the transition has gone swimmingly--thank the good Lord above. Our parents as teachers lady told us at her last visit to move him into his new room ASAP, so he gets settled and comfortable with it and doesn't see the new baby as "stealing" his old room. Duh. That was my thought too--we were just waiting on a few pieces of furniture to be finished before we moved him in! His new room is much smaller than his old one, but that's okay, because he doesn't really have that much "stuff." All of his toys and things he plays with are either out in the family room or in the basement (for whatever reason when we had toys in his room he'd just bring them out into the family room, so his room got quickly liquidated of toys, which was fine by us! 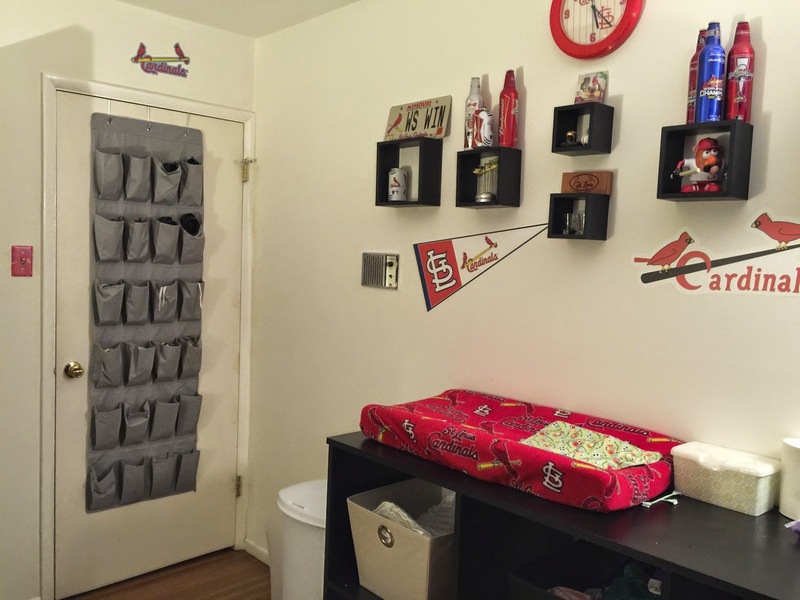 ), so his room just houses his bed, diapers, clothes, and a few other essentials that a 20-month-old requires. Unfortunately this was our guest room, so now (sorry Aunt Mary!) any guests who stay over and want to snooze get to do so on one of our many couches around the house. 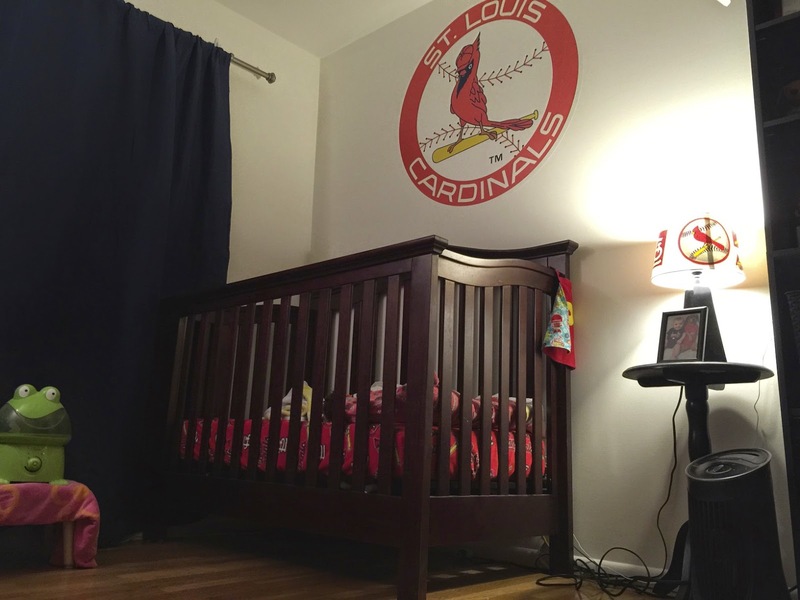 When we moved in last November we decided to do the then guest room as Cardinals themed, because it'd make for a perfect baby/kid's room in the future and we wouldn't have to repaint or redo anything (thinkers we are!). When we decided we'd move Patrick into the Cardinals room and keep the Muppets room for the new baby (because there's a TON of baby stuff in there: glider, rock-and-play, enormous closet for the enormous amount of stuff baby's require, etc...), we didn't have to do anything to the decor except take away the double bed and add his (new to us) crib and changing table/diaper storage. And yes, originally we were going to do a new room-new big boy bed transition, but, alas, we wised up and realized: if it ain't broke, don't fix it. Meaning, Patrick sleeps amazingly in his crib, doesn't climb out, so why move him out of that?! We were able to borrow a second crib from our friends, so that's where Patrick is currently residing until the status quo changes--so we are officially a 2 crib household now. BOOM. 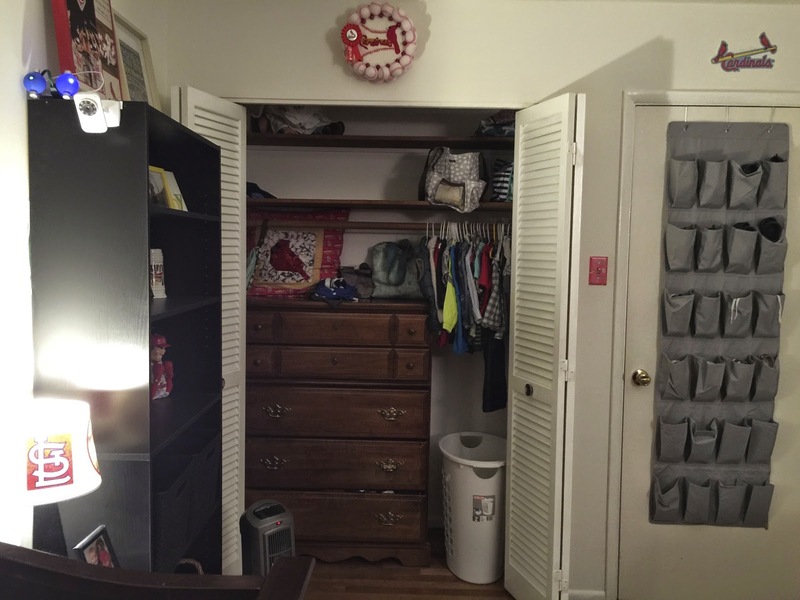 So, how about a little virtual tour of Patrick's new room? 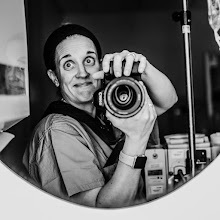 Cause I'm sure you hate my ramblings and just want pictures (hey, I do the same thing when I'm reading blogs!). Ahhhh, okay, here it goes. 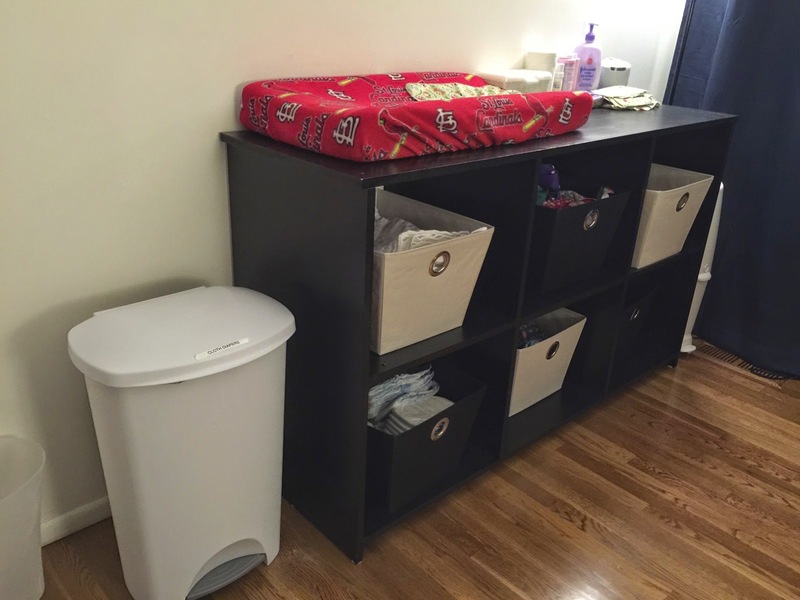 custom built changing table by my wonderfully talented (one of them!) brother Charlie. Houses all of our excessive stash of cloth diapers and supplies nicely too! 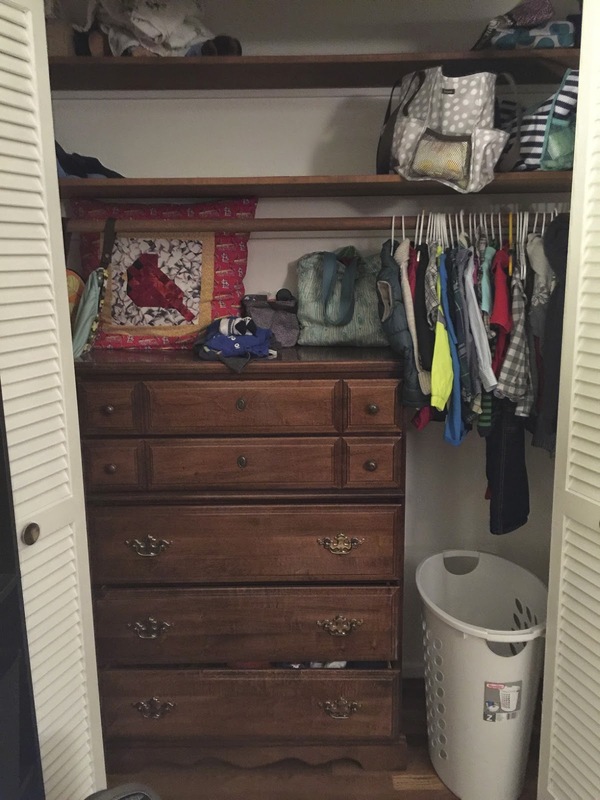 closet area with his dresser nestled nicely inside of it. He doesn't have that many hanging clothes, so they fit nicely on the side above his dirty clothes basket. Fairly empty bookshelf--I need to add some more Cardinals stuff and Cardinals themed pictures to it eventually! 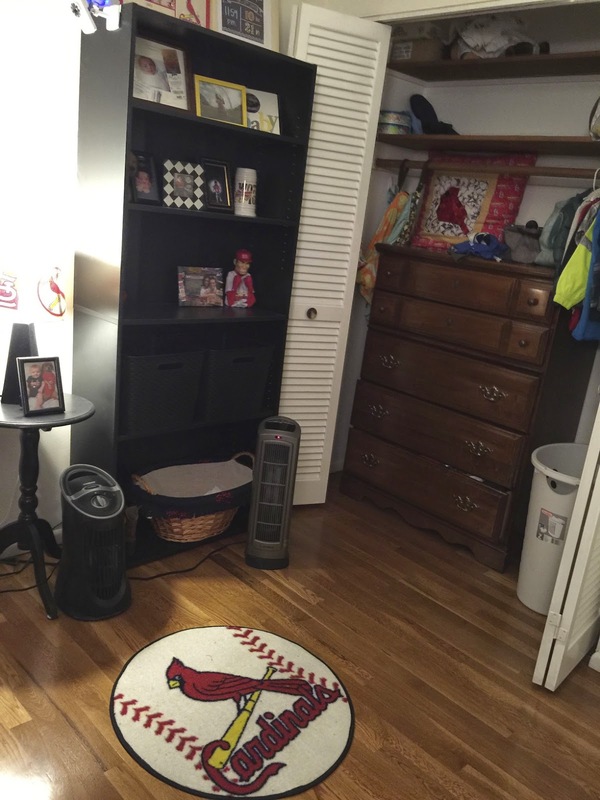 And I love his little Cardinals circle rug, but I'd like to get him a bigger 4x6 area rug (maybe baseball or Cardinals themed?!!) for the middle of his room too. 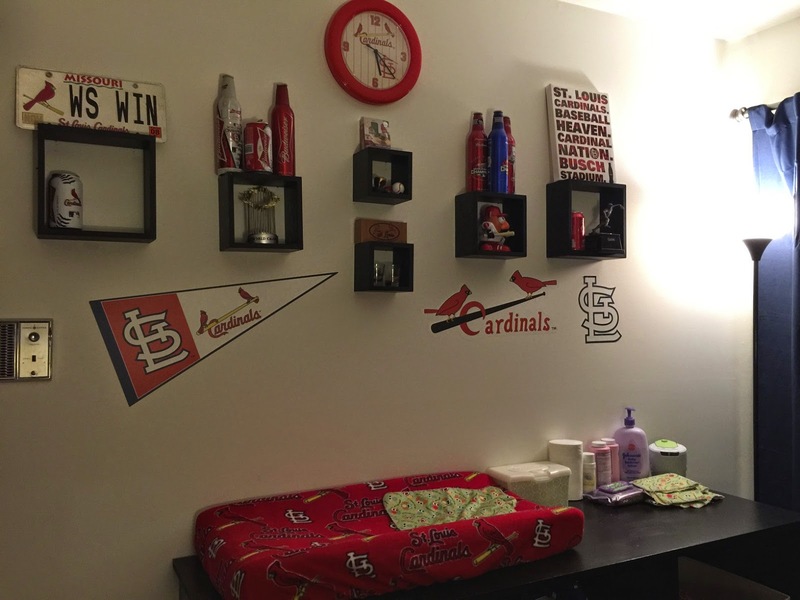 All of the decals on the wall are from Fathead and make for excellent easy accents throughout his room. The lamp shade I made with modge podge and Cardinals stuff I printed off line. How awesome are his custom (fleece! warm!) crib sheets?! My lovely mother made those just for him. So that concludes the pictorial tour of Patrick's new Cardinals room. Small, but cozy and he loves it! I really love how it turned out too. 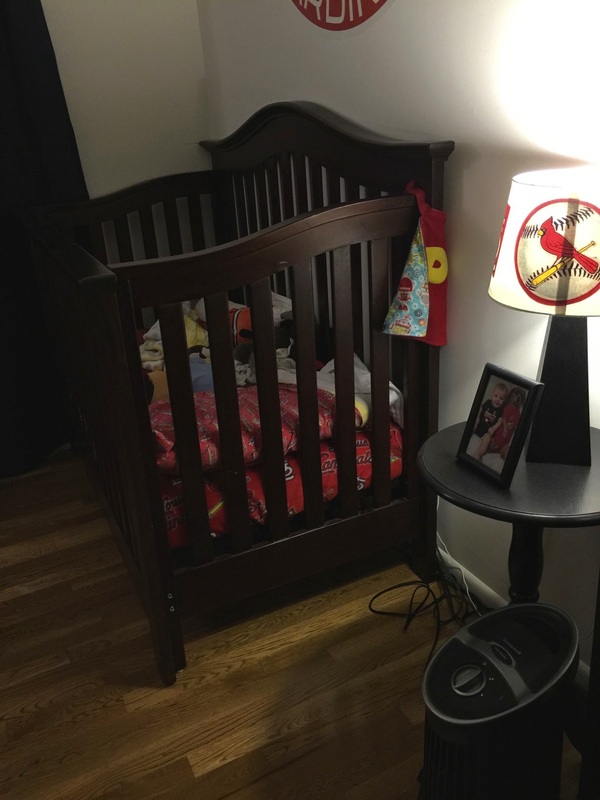 I don't for see us making any big changes to it in the coming years--except maybe for a smallish area rug for the middle, a big boy bed WHEN the time deems necessary, and some more Cardinals memorabilia. Other than that, it's staying as is! Hope you've enjoyed seeing Patrick's new living quarters!